This post generated from a simple question to the CHGC facebook page from a lady who wanted this weed and another to be identified and advice on eradication. A lot of discussion from contributors on various facebook pages warranted an in-depth investigation it was felt and to share that information on the CHGC website. Thankfully Colin (a CHGC web visitor) was able to give a name to this common weed so there was at least a starting point for further research. This weed is from the Euphorbiaceae family, which shouldn't surprise as it exudes a milky latex when damaged, which can burn the eyes and skin. 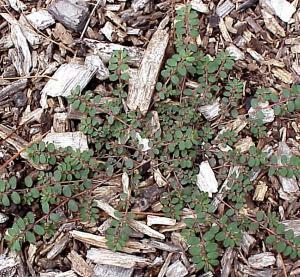 It is a small, short-lived, herbaceous plant with reddish or purplish creeping stems and have a single row of hairs along their length. The dark green paired leaves (3-8mm) have entire or finely toothed margins. Its tiny reddish 'flowers' are borne singly or in small clusters in the leaf forks. The tiny capsules (about 1.5mm long) are three sided, with hairs along the angles. These capsules have three compartments each containing a single pale brown or yellow seed. It has to be said though folks, that these plants are proliferative seed 'throwers'. The parent plant may not last long but they sure do their bit for generational continuance with copious 'babies'. 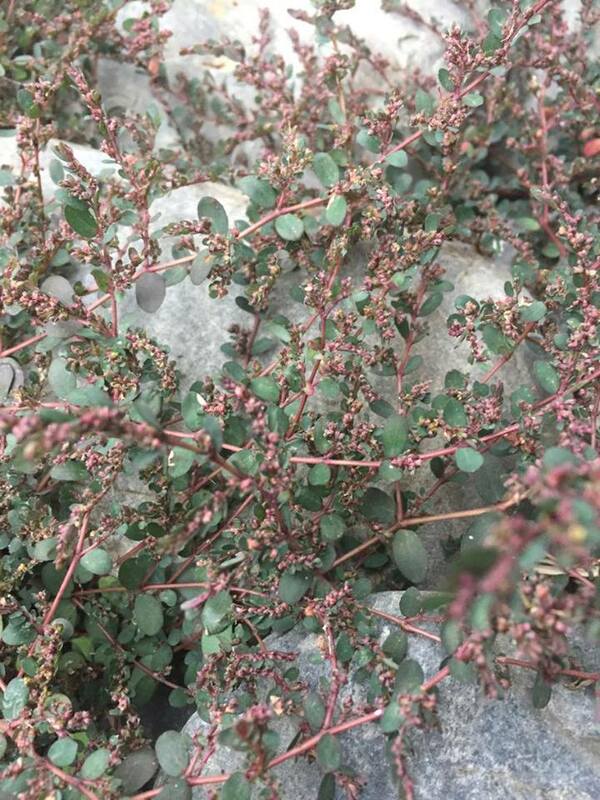 Also known as: blue weed, creeping spurge, ground fig spurge, ground spurge, groundfig spurge, hairy creeping milkweed, hairy prostrate euphorbia, prostrate mat-spurge, prostrate sandmat, prostrate spurge, red caustic creeper, red caustic week - so take your pick! Native to the USA, Mexico, Central America, the Caribbean and South America. Red Caustic Creeper can be found in gardens, footpaths, lawns, parks, nurseries, disturbed sites and waste areas. Dispersal of seeds is by wind, water, foot traffic, vehicles, contaminated agricultural produce and soil transfer. Eradication strategies: Small areas may be treated with a mixture of 20ml diuron plus 0.5g chlorsulfuron plus 25ml wetting agent in 10 litres of water. Spray the plants and a 4 metre buffer area until just wet. Repeat when new seedlings reach the 4-6 leaf stage.